I don’t eat much red meat. While I love a good steak on occasion, I typically opt for a seafood, veggie or poultry dish when cooking at home. Boy, that might change after making this fuss-free recipe! 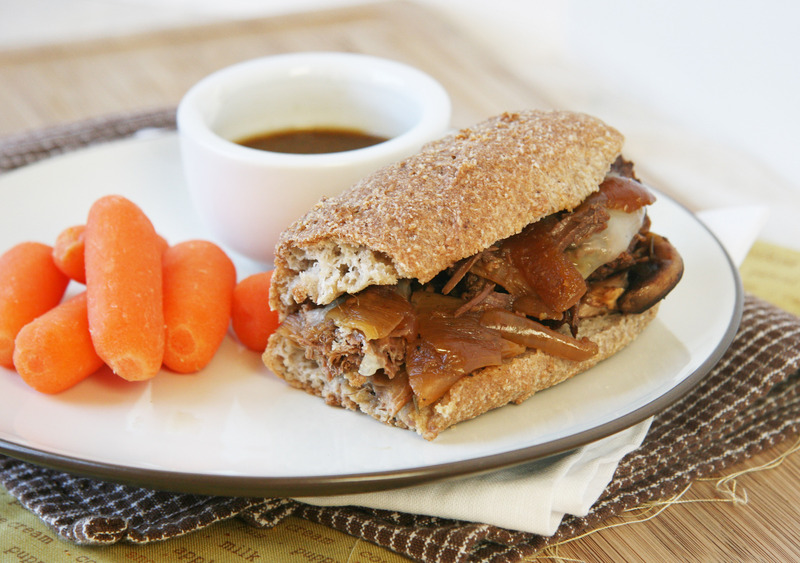 I adapted this dish from The Spiffy Cookie’s recipe for a slow cooker French dip sandwich. I was assigned Erin’s delicious blog this month for the Secret Recipe Club and could not choose what I wanted to make! I was salivating just looking through her recipes with many calling my name like her Reese’s Oatmeal breakfast cookie and Guiltless Avocado Alfredo with Spicy Chicken. 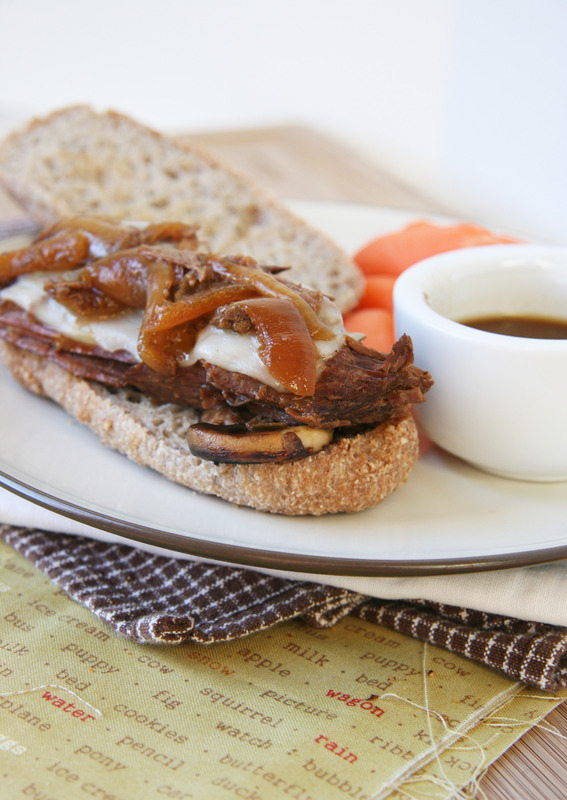 I’ve already started a list of must-makes from her archives but in the end, I selected a dish that forced me to dust off my crockpot that I hadn’t used in ages and get outside my comfort zone with my protein choice– the French dip. I adapted the recipe slightly by using London broil in place of chuck roast, rubbed the meat with onion powder and a pinch of dried rosemary and then seared the meat prior to adding to the slow cooker to add a little color. I also used a combo of coconut aminos and gluten free tamari in place of the soy sauce and omitted the Worcestershire sauce as I didn’t have any on hand. Since I love mushrooms and will find any excuse to include them in a recipe, I sauteed a few for an added bonus to my sandwich. Slice the onion into ~1/4-inch rounds. Keeping the rounds intact, place them in the bottom of the crockpot. Sprinkled the meat with salt, pepper and onion powder. Heat a large saute pan over medium-high heat and add 2 tsp oil/butter. Sear the meat on all sides until golden brown to seal in the juices and give the meat a little color. Add beef broth, soy sauce/tamari/ aminos, mustard, rosemary and garlic to the crockpot. Place meat on top of the onions. Cook on low 6-7 hours until beef is fall-apart tender. Shred meat with a fork or transfer the roast to a cutting board and thinly slice. Remove the onions and set aside. I strain the juice into a large “defatter” measuring cup and get rid of the oil that collects on top (I . Return the roast, juice, and onions to the crockpot for up to an hour before serving (I usually switch it to “Keep Warm” so it doesn’t continue cooking). While meat is on “warm”, heat a medium saute pan with remaining 1 tsp of oil/butter. Add mushrooms and cook until golden brown, stirring often. Season with salt and pepper is desired. Heat the broiler. Place the split sandwich rolls on a lined baking sheet and toast for 1 minute or just until the bread begins to brown. Remove the tops from the pan. Lay the beef on the bottom of the rolls and top with mushrooms and cheese. Return to the oven just until cheese is melted. 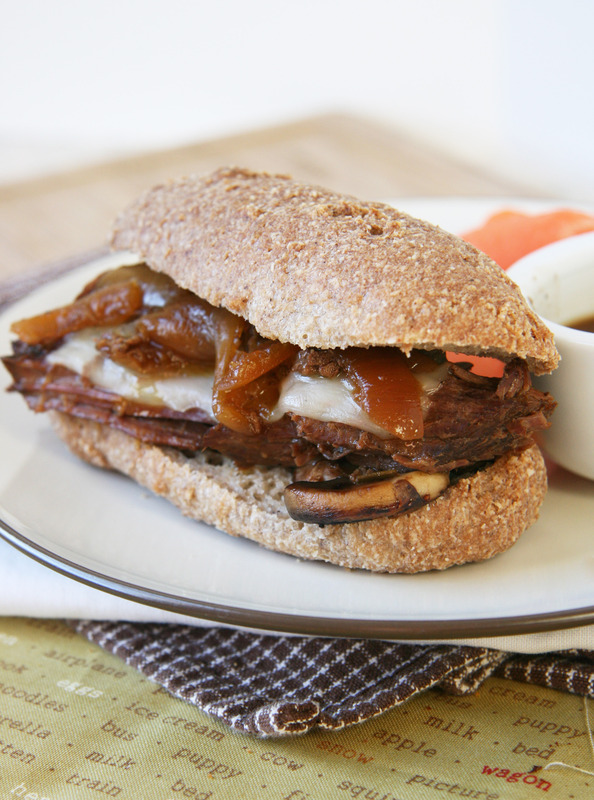 Top with onions and sandwich halves and serve with small bowls of au jus, Enjoy! For other scrumptious recipes from this month’s assignments, visit the link below! I have been in quite the soup mood lately. I’m blaming it on the rainy, cold and windy weather. 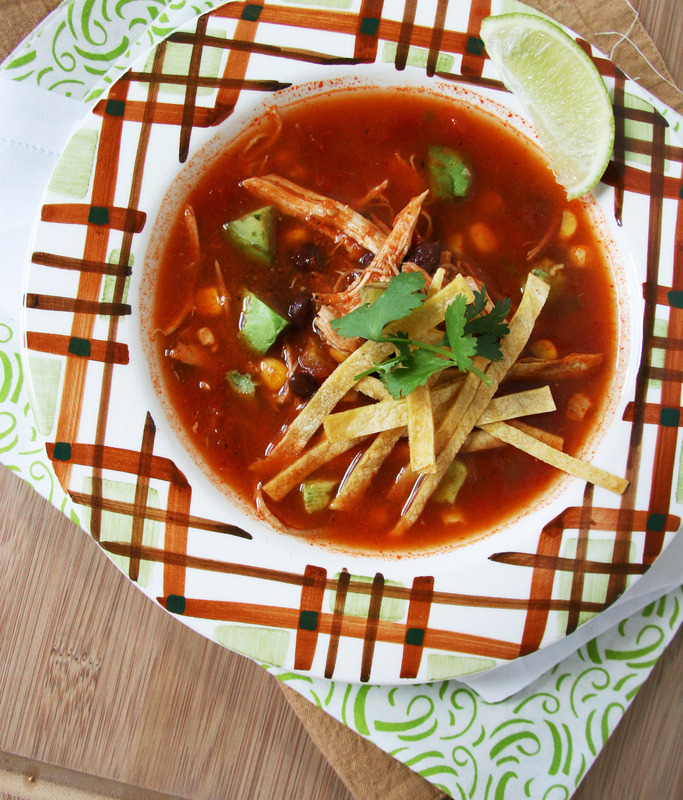 All I want is to be bundled up on the couch with a blanket and a giant bowl of soup — with this chipotle chicken tortilla soup to be exact. It’s delicious, warms you to the core and fills you up! 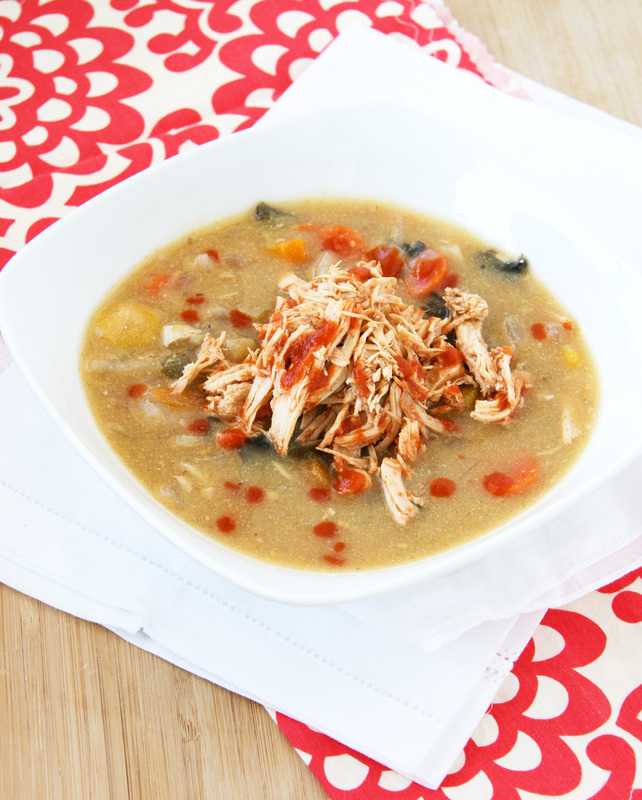 This soup can be made on the stove top or on in the Crockpot for an easy meal that will be ready when you get home after a long day. 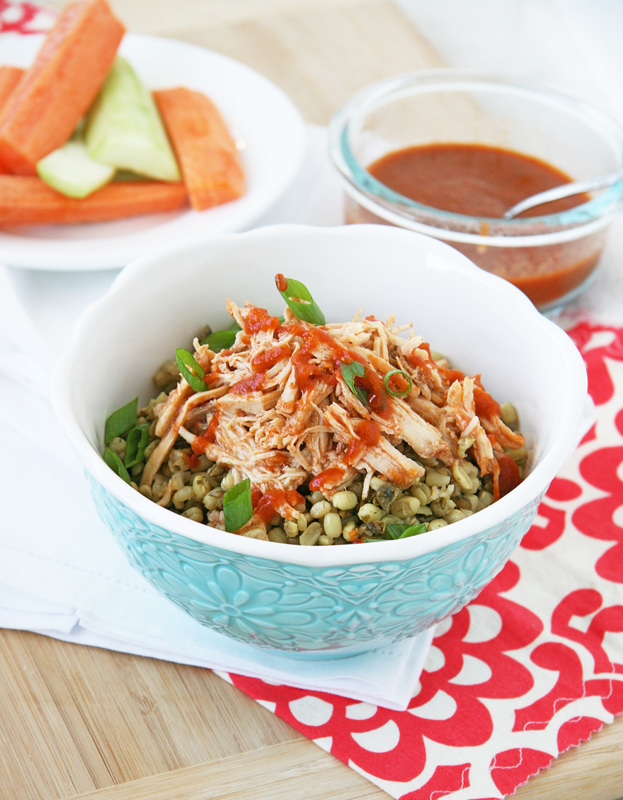 I opted for the quicker stovetop version made with a store-bought rotisserie chicken for an easy weeknight meal that made for scrumptious leftovers for lunch too! I even made my own tortilla strips for an extra special touch! If you want a quicker route, you can easily substitute tortilla chips. 1. In a large soup pot, add oil/butter over medium heat. Add garlic, jalapeno, and onion and saute for 2 minutes stirring frequently. 2. Add spices and saute for 30 seconds until fragrant and pepper and onion are fully coated. 3. Add remaining ingredients (stock/broth through corn) and bring to a boil. Cook for 2 minutes then reduce heat and simmer for at least 30 minutes to allow flavors to meld (60 minutes is recommended). 4. Meanwhile, (if you are making homemade tortilla strips) heat 1/2 tsp of oil in a medium skillet over medium heat. Add a handful of strips at a time and cook stirring frequently until crisp like a chip, about 3-4 minutes. Sprinkle with salt remove from pan. Repeat with remaining strips. 5. 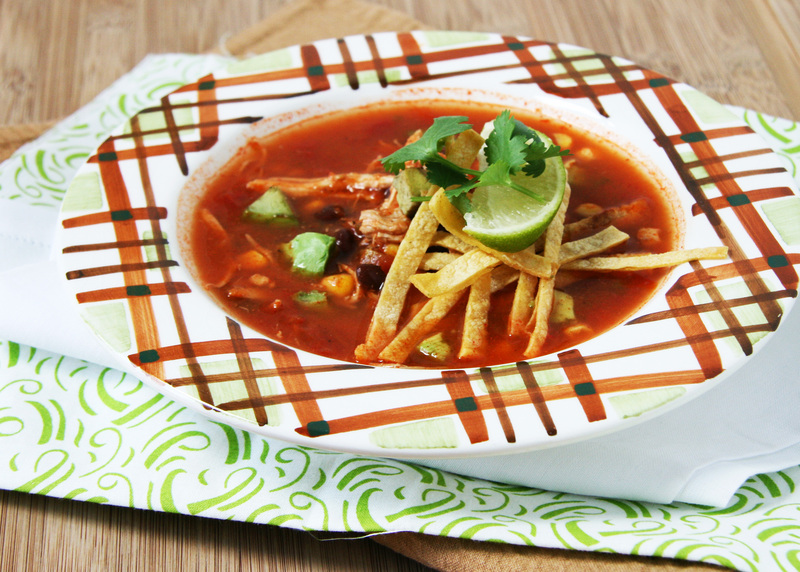 Serve soup in bowls and garnish with avocado, cheese (if desired), a squeeze of lime, tortilla strips and a sprinkle of cilantro. Enjoy! 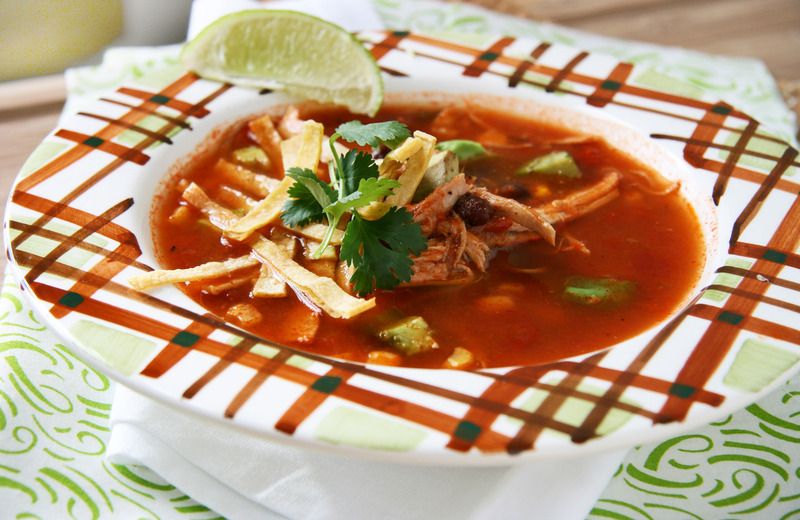 For a crock-pot preparation, throw all of the ingredients except for the garnishes into the slow cooker and cook on low for 8-10 hours or high for 5-6 hours. I adore my crockpot. Attendees at my bridal shower several years ago would be able to tell you exactly how much I love this appliance. I actually squealed with joy when I opened up the gift, and the rest of the ladies laughed at my excitement. You see, I had been following Stephanie O’Dea at A Year of Slow Cooking and her resolution to use her crockpot every day in 2008…and I couldn’t wait to try out her creative recipes. However, I didn’t own a slow cooker at the time and I was specifically told NOT to purchase one since I had hand-selected one for our wedding registry. To my delight, I did receive my own crockpot a month or so later and set off to start (slow) cookin’! 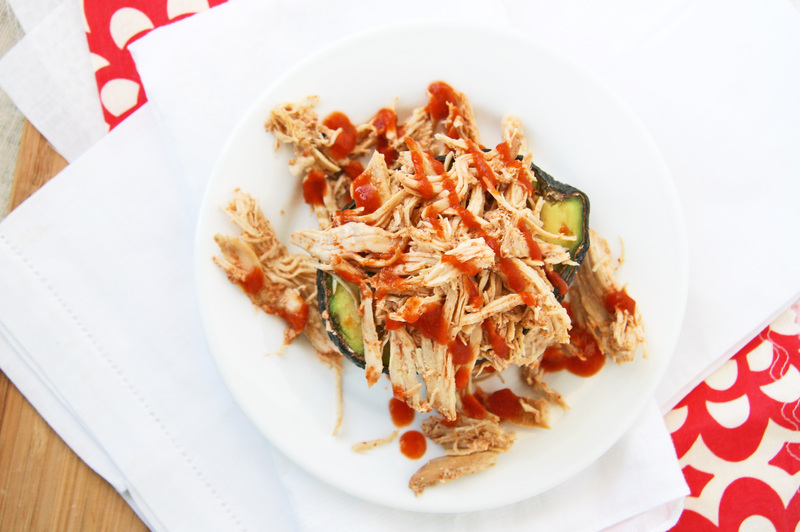 Here’s a crockpot recipe you can throw together before work so dinner will be ready to serve when you get home, not to mention your house will smell divine with a scent of cumin and sweet spices. The only additional item you’ll need to prepare is either rice (could use quick brown rice), fast-cooking GF couscous or quinoa for serving. Or, if you’re like me, you can defrost extra rice you have lying around in the freezer to speed up the process. 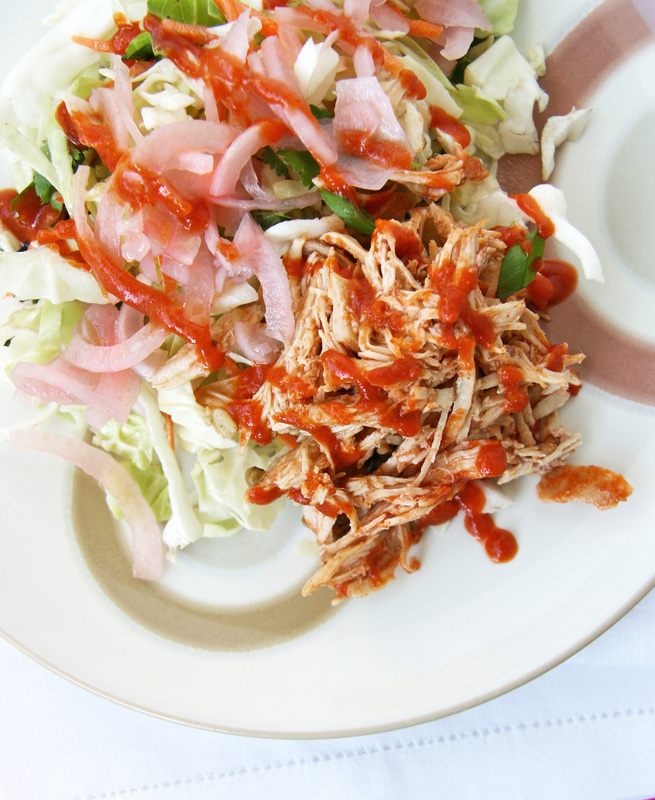 Are you tired of the same old slow cooker recipes? Instead of your usual beef roast with potatoes, give this recipe a try. I can almost guarantee it won’t be the last time you’ll serve this dish! 1. 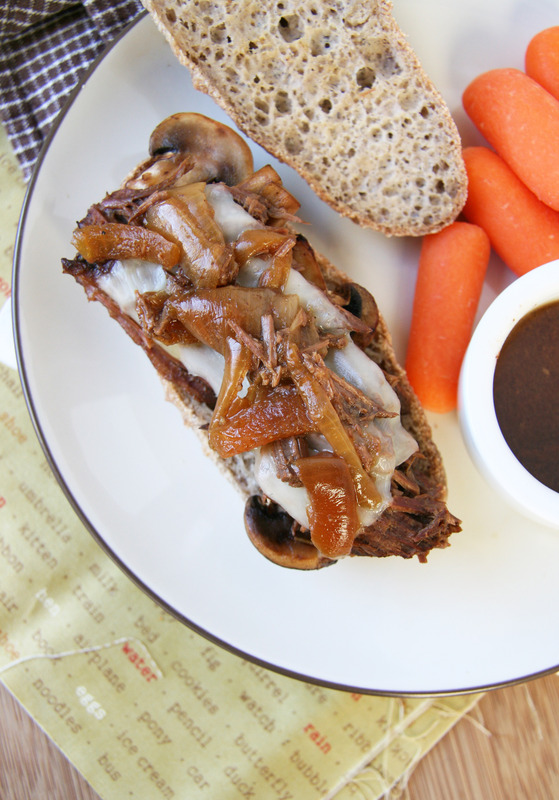 In a 5-quart or 6-quart slow cooker, add onions and carrots. Place chicken on top of vegetables and sprinkle with sea salt. 2. 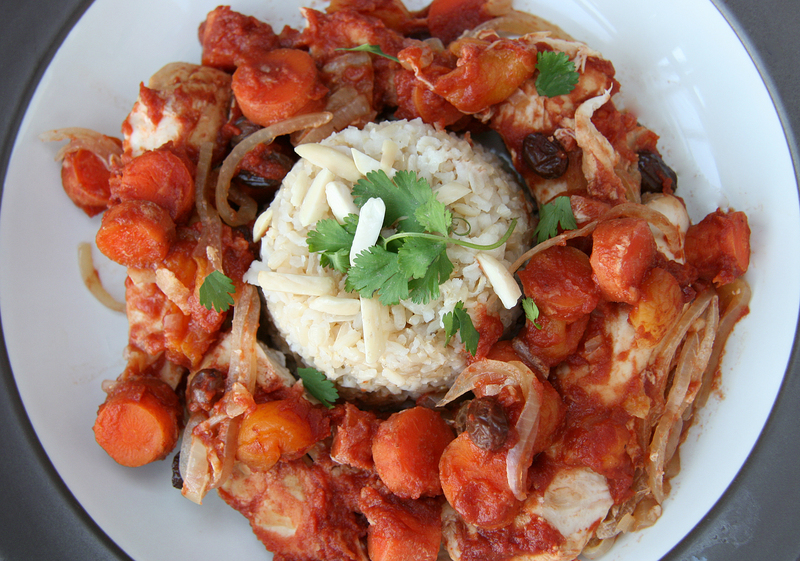 Sprinkle raisins and chopped apricots on top of chicken. 3. In a small mixing bowl, add the remaining ingredients (broth through pepper) and whisk to combine. Pour over chicken. 4. Cover and cook on low for 6 1/2 to 7 hours or 3 1/2 to 4 hours on high. 5. Add rice/quinoa/couscous to bowl and spoon chicken mixture on top. Sprinkle with toasted almonds and garnish with cilantro. Enjoy! 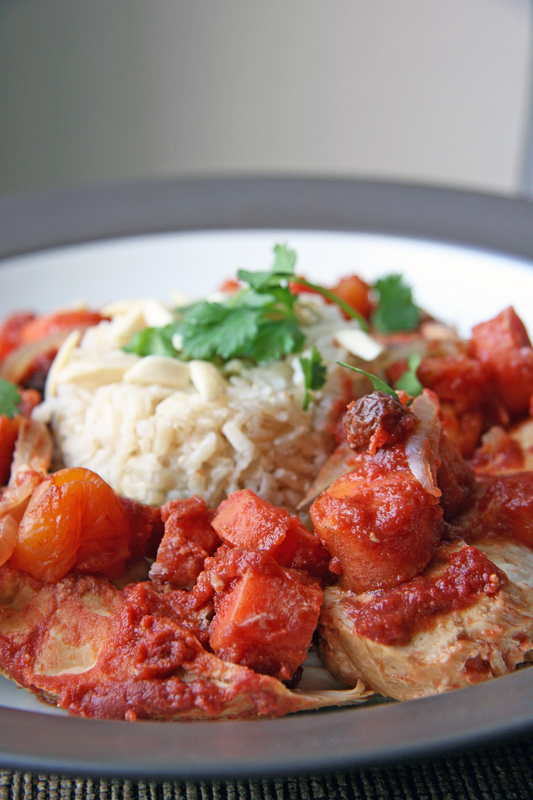 Recipe Notes: If you are using boneless chicken pieces, you always shred the chicken in the cooker, then stir to combine and serve over rice, if preferred to chunky pieces. This recipe is featured on this week’s Slightly Indulgent Tuesdays over at Amy’s lovely Simply Sugar and Gluten Free blog!